This article follows up another I wrote in 2011 about visualizations of Last.fm listening histories. I ended that article with a comment on the many other types of visualizations of Last.fm data. These visualizations are made possible by the Last.fm API, which supports a broad range of queries about many aspects of Last.fm data. Here I look at some of the other types of visualization designers have created using Last.fm data. used this data to construct the graphs shown below. 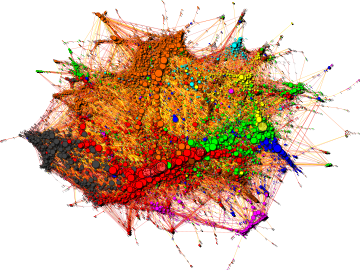 Each node in the graph is an artist (coloured by musical genre) with edges connecting artists with high similarity indices. Force-directed layout is used, so clusters form representing the various musical genres. More details about the graphs are available here. 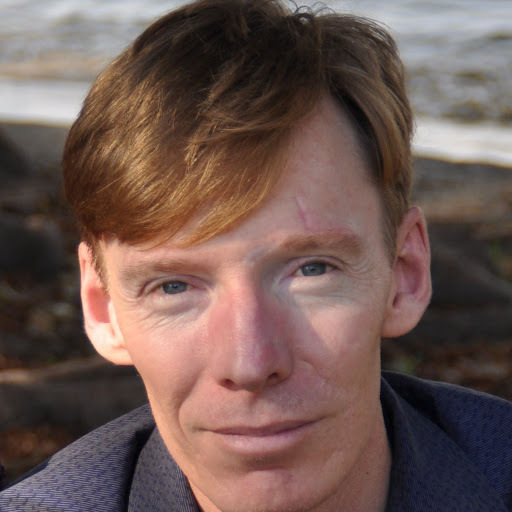 Last.fm users can become friends with other Last.fm members, forming a social network. Connections are usually made on the basis of shared musical taste but this need not be the case. The social network can be queried via the Last.fm API. 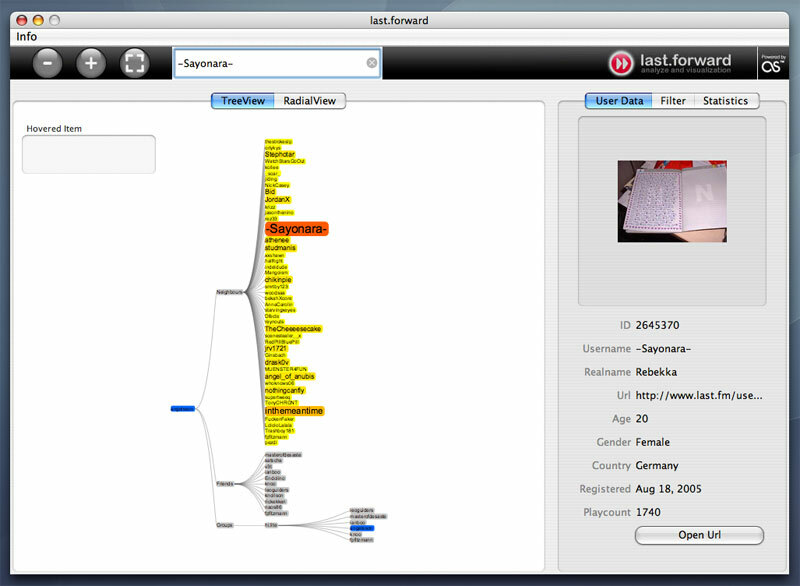 Last.forward visualizes the Last.fm social network using either a tree view or radial graph, as shown below. 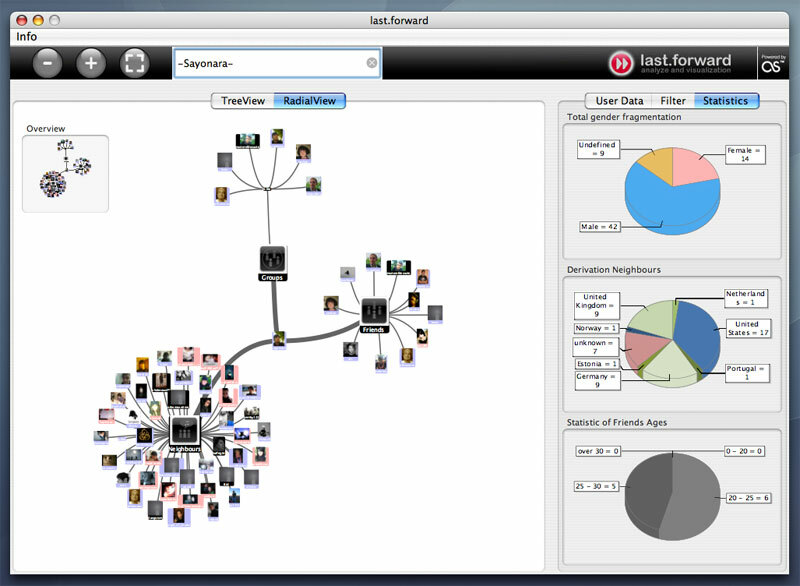 Nodes (users) in the graph can be selected to obtain user details and statistics. Last.forward is written in Java and is open source; the source code is available at SourceForge. Last.fm allows users to tag artists. As usual this tag data is available via the Last.fm API. 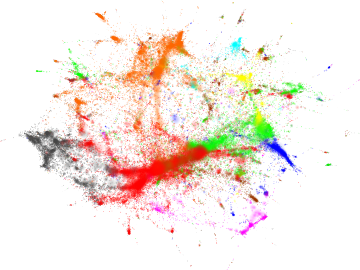 Over at NEXTVIS they've created a visualization based on comparing two artists' tags. Tags are represented by circles (horizontally) positioned according to the relative strength of their association with each artist but it's not clear how they are positioned vertically. Nor is the size of a tag's circle made clear (number of times tagged?) A couple of examples are shown below. If you come across any other interesting visualizations of Last.fm data then please leave me a comment.